Black knot is host to many Prunus species, both edible and ornamental are susceptible. Included are most species of Cherry trees, Flowering Almond trees, Apricot trees, Chokecherry trees, Peach trees and Plum trees. 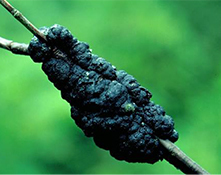 Black knot causes large black swellings up to 10 cm long on branches and small twigs, eventually girdling and killing the branch. The first symptom, which often goes unnoticed, is a swelling of the twigs of the current year’s growth. 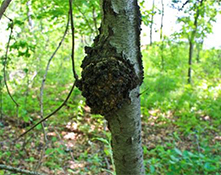 Knots or galls develop from swellings on branches and trunks of infected trees. Bark splits on the galls and galls appear corky and green. By the following spring, the galls are hard and black. They are obvious on branches in association with bent or curved twigs. Girdled branches usually die. This fungus overwinters as fruiting structures on the surface of knots. The spores are released in wet spring weather, and infection follows on succulent shoots or wound sites. Swelling does not appear until the fall after infection. Cankers continue perennial development on the stem, and two years after initial infection the knot has its first fruiting structures at the edges of the swellings. Spores are released and initiate new infections. In some cases, fruiting structures form in as little as one year after infection. 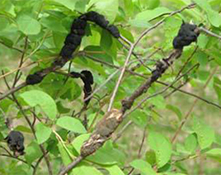 Wild plums and cherries are very prone to infection by black knot. Symptoms on wild Prunus may not always be obvious, so these species need to be carefully observed for knots. Infected wild trees should be removed. Remove galls on established trees during the dormant season, when galls are fully developed for the year. To be certain that all of the gall is removed, cut several inches below the knot. Fungicide treatments are not an effective means of control in the landscape. Plant resistant species.